Below, we look at how the artist expressed the rhythm of jazz music in "Dancers"
Born in Charlotte, North Carolina on Thanksgiving Day in 1907, Charles Alston was the youngest of five children. His father was a well-respected Reverend in the community, but he died when Alston was only three years old. Alston’s mother Anna Miller later married Harry Bearden, uncle of Romare Bearden, which is why Alston and Bearden referred to each other as cousins. Soon after, the family moved to New York. In 1925, Alston was offered a scholarship to Yale University School of Fine Arts, but chose to attend Columbia University. He received an undergraduate degree from Columbia in 1929 and a Master’s degree from Columbia’s Teaching College. He later attended Pratt Institute (1944–45) to study commercial art in order to diversify his commissions and earn a better income. An accomplished and talented painter, sculptor and muralist, Alston was also a teacher, one who recognized the ability in a young Jacob Lawrence and fostered his development. Alston encountered 14-year-old Lawrence during his first job out of college as Director of the Boys’ Program at the Utopia House in Harlem, a community center for children of work- ing mothers. Alston said of Lawrence: “. . . I’m glad I had the sense at that time to realize that this kid had a very unusual, unique kind of talent, and way of seeing things. I wouldn’t even let him watch me paint. And I tried my best just to protect this very unique quality in Jake” (Oral history interview with Charles Henry Alston, 1968 October 19, Archives of American Art, Smithsonian Institution). Lightfoot and several other Harlem artists. Its mission was to place more Black artists into WPA projects. Alston was a pioneer in many regards. He was the first African American to teach at the Art Students League. He was the first African American supervisor of the WPA, managing the completion of the Harlem Hospital murals. Thirty-five artists worked to paint murals throughout the hospital, including Beauford Delaney. 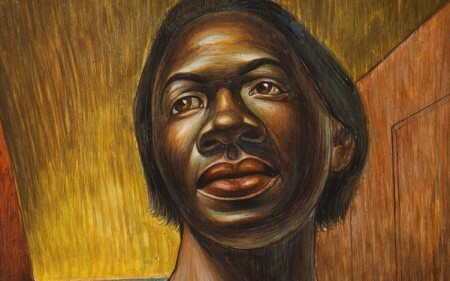 Alston was also the first African American to be appointed to the Art Commission of New York City, which awarded public sculpture and mural com- missions. In the Depression years, Alston was inspired by the Mexican muralists Jose Clemente Orozco, Diego Rivera and David Alfaro Siqueiros. He transferred to the WPA’s mural project mentioned above as a result of interactions with Diego Rivera when he was painting the mural at Rockefeller Center. Alston would do several other murals, including one for the Golden State Mutual Life Insurance Company in 1948, a diptych with Hale Woodruff; one at Lincoln High School in 1955; and one at the Museum of Natural History in 1958. 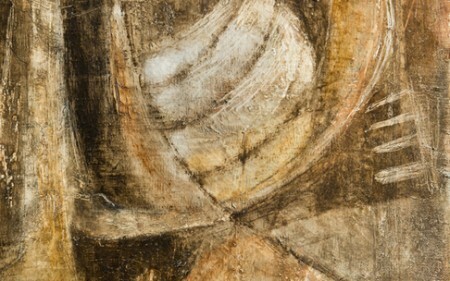 In 1950, Alston entered an abstract painting in a juried national competition at the Metropolitan Museum of Art. He won first prize and was offered $1,500 by the Met to buy the painting. This essentially launched his career as a full-time artist. Alston loved jazz. He began to paint jazz themes in the 1930s. In Dancers, the rhythm of the jazz music is expressed through the tilt of the figures’ heads, the bends of their backs and knees, and the lightness of their feet. Long sweeping brushstrokes across the top of the painting portray the movement of the dancers. In addition to the fluid strokes of paint, Alston often used a palette knife to add texture and interest to a painting’s surface. A punch of color also characterizes this painting. Alston defines his forms by color—not color laid over form, but color that the form absorbs and then projects from within, with real volume (Alvia J. Wardlaw, Charles Alston, The David C. Driskell Series of American Art: Volume VI, p. 35). 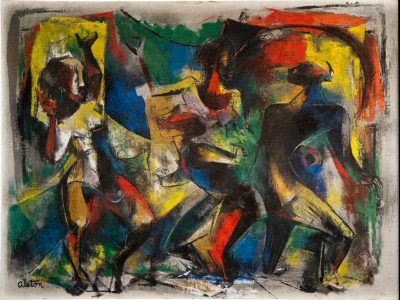 Dancers combines primitive and African influences with bright colors and a fascinating surface to convey the loose movements of a jazz dance.